Back in January 2016, when the Chinese bought up Corbis and Demotix where I was placing many of my pictures and handed their entrails to Getty, I began to put many of the pictures I was taking into Facebook albums as well as sending them to agencies. I hadn’t been happy with Demotix for some years – particularly since they sold out to Corbis, but they had the advantage for me of presenting my work as coherent stories with text and captions that were easy to link to – so I could post links to these stories for my friends on Facebook and also others, particularly those who had taken part in the events I had photographed. I’ve lost count of how many albums I put on Facebook in 2016, though at a rough guess they would contain around 5000 pictures. So when I read an advert on Facebook offering to make an album of my year I was intrigued to see what they would make of them, and clicked the links, though I had at the time no intention of buying the book from ‘Re-Snap‘. 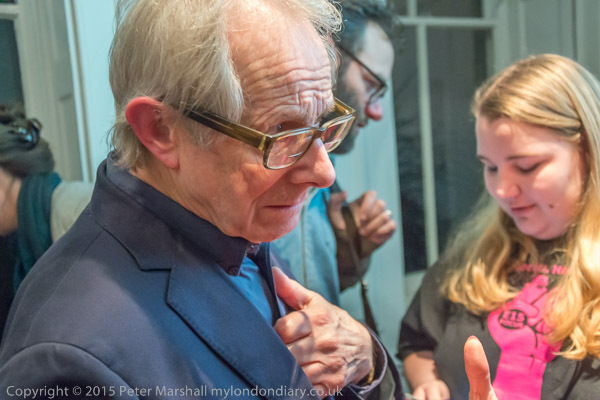 All of my images on-line at Facebook are uploaded at 600×400 pixels and with my watermark – exactly the same images as I post on My London Diary (though sometimes these are a little tidied up as I generally post them there rather later.) Printing at the normal standard of 300dpi would result in images only 2 inches wide, and while the smallest images in the book are not much larger than this (I think around 3.5 inches) others are significantly larger – around 8 inches) and on the covers and a few inner images cropped to an 8.5 inch square they are even further stretched – to 12×8.5 inches on the cover (which also requires a slight crop. A little simple maths gives a figure of around 47 dpi. The book actually looked pretty good on screen, and I couldn’t resist going ahead with the order. Of course I could have done a better job myself, more selective and with better quality originals, and the selection algorithm hadn’t included a number of my favourite pictures from the year. There were just too many pictures from some events that were just a little too similar for me to have included them. But as a fairly random selection of typical images from the year it seemed useful, the kind of thing I could possibly had to people who ask me ‘So what do you photograph?’ as a view of my current work. Possibly one day I’ll make a better book of 2016, but it would probably take me a week or so to put together, and still cost almost as much as the roughly £50 for this volume (allegedly on special offer), so I clicked and went ahead. It’s possible to edit the book, take out pictures and choose replacement images, but I decided to make only a single change, removing an awards certificate for this blog. 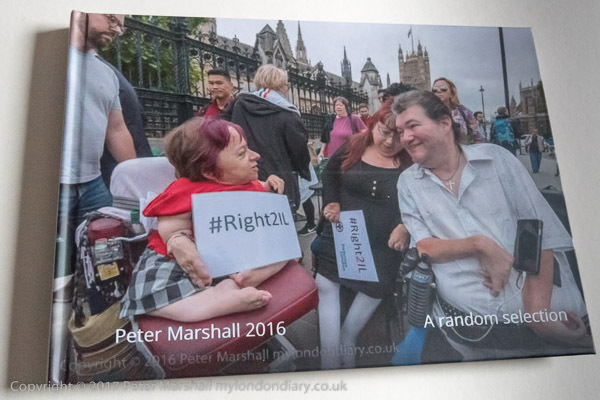 Essentially I wanted to retain the automatic selection which was reflected in the title I added to the cover, ‘Peter Marshall 2016 – A random selection‘. I missed one picture that I should have removed, by my friend Townly Cooke who died last year – though I was happy with it appearing once, I should have removed a second, smaller version of the same image, but I must have turned over the page too quickly to notice it. Obviously the quality of the highly upsized images is noticeably poorer, but the pictures still work, and however Re-Snap upsizes them, it does a pretty good job. 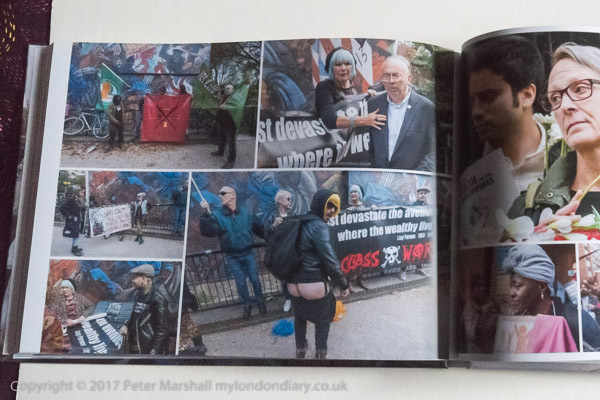 Obviously the larger images don’t stand up to detailed scrutiny, but if you saw them in – for example – the pages of a newspaper, they would be acceptable. My main complaint is that the printing inside the book lacks vibrancy, almost as if it had been printed with watered-down inks, rather than any lack of detail or sharpness. It’s acceptable but lacks the punch of the original sRGB files, though the colour balance seems more or less spot on. Seeing the result, I’m rather pleased that I now watermark all the new images I put on Facebook – and the watermarks are present throughout this book. It doesn’t stop people using my images without permission, sometimes complete with watermark, but more often cropping it or even removing it in Photoshop, both of which seem a clear admission of guilt. If only I could find a few abusers worth suing in the UK courts. I wrote a post here some while ago about an images that I had found used without permission on over 80 web sites, none of which on investigation I felt were worth pursing. And recently, Google have published a paper on https://arxiv.org/pdf/1702.00783.pdf Pixel Recursive Super Resolution which doesn’t make for easy reading, but essentially shows how a believable image (rather than the actual original) can be created using neural networks from even a very small 8×8 pixel pixillated image. Unsurprisingly it works better on reasonably predictable subject matter, such as faces (which after all generally have the same number of eyes, a nose and a mouth) than other subjects. And the most predictable images of all must be the photographs of ‘celebrities’ that so obsess our popular media. There can’t really be any need for yet another photograph of any of them, yet outside the Albert Hall yesterday was a pen crammed full of photographers with hardly room to swing a lens, when inputting a little blur and typing in a name – for example ‘Ken Loach‘ – could surely have generated an equally newsworthy image. It was of course not his image, but his film, I Daniel Blake, and his speech that were newsworthy, telling to the nation the truth about the terrible treatment of benefit claimants by the DWP, something that all those who visit our job centres or talk to those who do already know, but which the complacent well off like to assure us doesn’t happen. And while some news outlets reported it, the BBC did their best to play it down, ignoring it in their early bulletins, though rather grudgingly reporting it later. I mention him mainly because I’ve photographed him on a number of occasions in the past, but there was no way I’d ever cover an event like that. I was having much more fun a few miles to the west at the Willesden Green Wassail. This entry was posted on Monday, February 13th, 2017 at 03:23 pm and is filed under My Own Work, Photo Issues, Reviews etc. You can follow any responses to this entry through the RSS 2.0 feed. You can leave a response, or trackback from your own site.